Super-charge your Pavlova this Australia Day by adding some delicious fruit-flavoured Jelly Belly jelly beans. 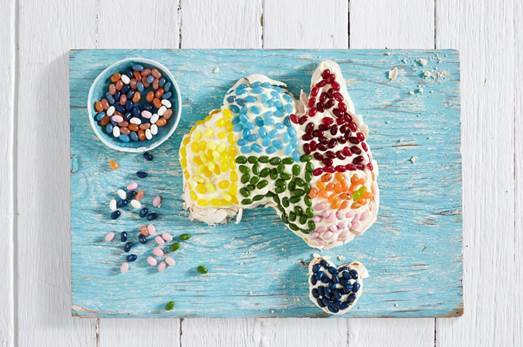 The kids will love decorating this gorgeous Australia Day treat. 1. Preheat oven to 180°C or 160°C fan forced. Line a large tray with baking paper. vinegar and vanilla, and fold in lightly with a metal spoon. Australia shape. Repeat for Tassie. Top with any remaining meringue and pile as high as you can. 5. Reduce heat to 150°C or 130°C fan forced, and cook for 30-35 minutes till slightly golden. Turn off oven and leave Pavlova to cool completely. territories. Dust with icing sugar if desired. Jelly Belly used – Very Cherry, Green Apple, Lemon, Berry Blue, Blueberry, Cotton Candy and Tangerine.